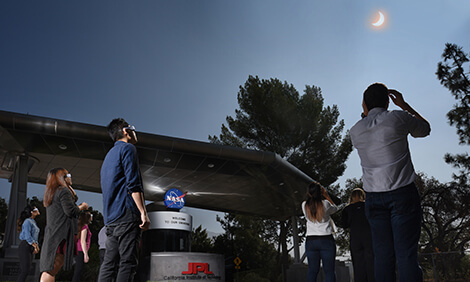 NASA employees and visitors watched the total solar eclipse from NASA’s Jet Propulsion Laboratory in Pasadena, California. People across the United States took an “astronomy break” on the afternoon of August 21, 2017. That’s because a once-in-a-lifetime event was taking place in the sky. It was a total solar eclipse, which is what occurs when the moon moves directly between Earth and the sun. During a total eclipse, the moon blocks all of the sun’s main body and most of its light. Only the sun’s corona, or outer atmosphere, can be seen. The corona is only visible during a solar eclipse or with a special telescope. Solar eclipses happen often, but they’re not usually visible across the continental United States. Many eclipses can be seen only from the middle of the ocean, making them difficult for most people to view. The eclipse on August 21 was best seen at different times of the day along a diagonal path from northwestern Oregon to southeastern South Carolina. The last time so many Americans had such a good view of an eclipse was in 1918. People held viewing events all across the country for the “Great American Eclipse.” Events were held at elementary schools and high schools. Some universities in the path of totality, such as the University of Missouri in Columbia, Missouri, offered special viewing events for students and alumni. In addition to special viewing opportunities, the city also had a free concert to celebrate. In Big Summit Prairie, Oregon, visitors took part in the Oregon Eclipse Festival. There, people camped, attended art installations and workshops, and listened to music at seven concert stages in the days leading up to the eclipse. In Washington, D.C., President Donald Trump and First Lady Melania Trump viewed the total eclipse with their son Barron from the Truman Balcony of the White House. The United States Post Office issued a special eclipse stamp. The stamp was made with ink that is thermochromic, or heat-sensitive. When it is warmed, such as with the touch of a finger, the moon appears on the stamp. When it cools, the moon vanishes. Looking directly at the sun at any time can seriously damage your eyes. It’s especially dangerous during an eclipse. One way to safely view an eclipse is with special glasses. Another way is with devices, such as pinhole cameras, that allow you to see images of the eclipse. Those who were not in the good locations or did not have the right equipment to view the eclipse were able to watch a live stream through NASA’s website, Facebook, or Twitter page.